A few days ago in a foggy morning I made up my mind to go to Srimangal with my brother and his friends. I had no single friend of mine with me still I took the risk to have a journey along with strangers. At the very beginning it was quite uncomfortable for me. But whenever I imagined I was going to Srimangal to see the tea garden that removes all of my tensions. We all gathered Mirpur-10 ‘golchottor’ sharp at 7:30am. I know it is bit irritating to get up 7am in December month. But honestly we all did not feel like in that way. On the other hand, we all reached there before the following time. Anyway we started our journey. After 1 hour later we stopped to have our breakfast. We all had light snacks along with tea. Again we started our journey and around 3 hours later we stopped in a hotel ‘Bismillah Inn’ which is very famous for Sylhet going travelers because all Sylhet going travelers stop there and have their breakfast, brunch, lunch or whatever they want to do. We relaxed there for a while and took tea and countdown the time when we would be able to see the scenario of tea garden. Around 2 hour later we could see the ‘tilas’ which are both sides of the streets. And obviously the ‘tilas’ are covered by green tea trees. These are the tea gardens. Where we stopped, the tea garden actually belongs to Ispahani industry. Some areas were restricted. 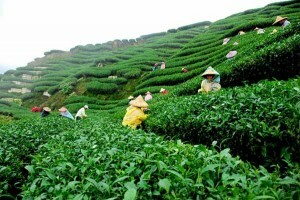 Restricted areas were barricaded and some working people took leaf form the tea garden. That looks awesome. We took lot of photos in the garden, roam around here and there. Spending some time there we went ‘Kutumbari’ to have our lunch. As we were so hungry at the same time the food was delicious we took over in our stomach that made us sleepy and idle too. So we thought that we should take tea but one of my brothers friend told us that we should not take tea right away because we were going to ‘Nilkanto Tea Stall’ which is famous not only in our country but also in foreign. After hearing these we all became excited and regained our spirit without having tea. Where ‘Nilkanto Tea Stall’ exists that place is wonderful. The most wonderful thing is that the tea stall has a great collection about getting prizes and honor from many countries. That was an amazing feeling of mine. Anyway, we all took different types of tea along with 7 layer tea and had a wonderful evening on there. Having sweet memory of Srimangal we ended our journey there and get into car to return back to Dhaka city. Reading the peice, I felt a pang in my heart. If I were there o dear Srimangal. ghurte jabo. kothay jaowa jay.